DIRECTIONS: Mix the cocoa powder with the sugar on one of the small plates. Add a splash of chocolate vodka to the other small plate. Dip your glass rim in the chocolate vodka then the cocoa mixture. Chill Glass in the freezer. Add the ingredients to a cocktail shaker filled with ice and shake until well chilled. Strain into the chilled glass, garnish with the dark chocolate shavings and serve. The devil made me do it. 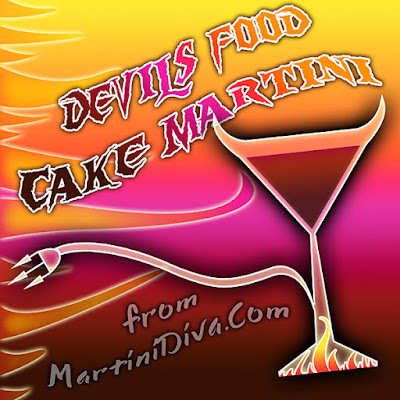 If you're not into brimstone, try my other Chocolate Martinis or my other Cake Martinis. *Ever wondered about where all these special commemorative holidays come from? Read: NATIONAL WHATEVER YOU WANT TO CALL IT DAY.